Supporters say the legislation proves that protections for the LGBT community can co-exist with the rights of religious people. 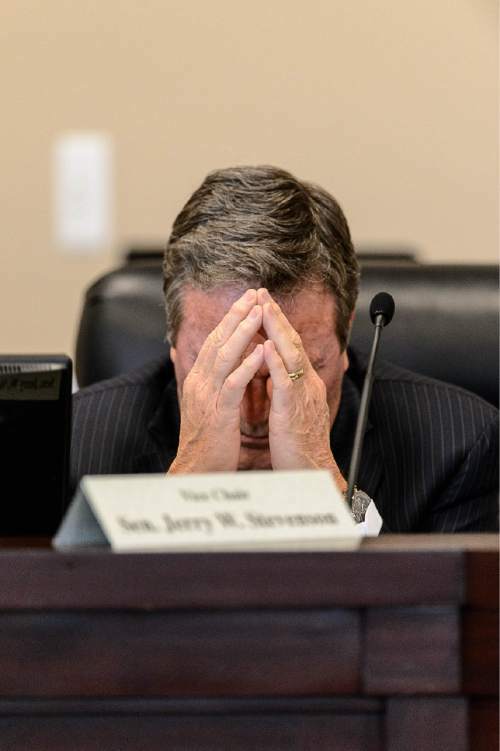 Trent Nelson | The Salt Lake Tribune Rep. Joel Briscoe, Salt Lake City, during a meeting of the Executive Appropriations Committee, Wednesday March 11, 2015. Trent Nelson | The Salt Lake Tribune Sen. Jerry Stevenson, Layton, during a meeting of the Executive Appropriations Committee, Wednesday March 11, 2015. Trent Nelson | The Salt Lake Tribune Rep. Dean Sanpei, Provo, during a meeting of the Executive Appropriations Committee, Wednesday March 11, 2015. 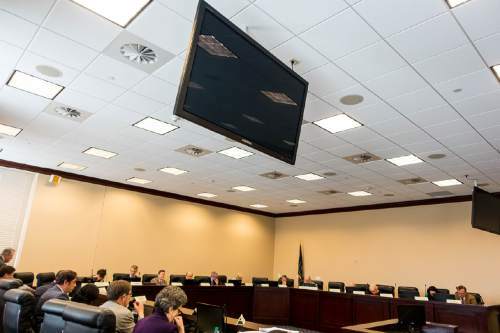 Trent Nelson | The Salt Lake Tribune The Executive Appropriations Committee meets, Wednesday March 11, 2015. Trent Nelson | The Salt Lake Tribune Robin Wilson, a professor of law from the University of Illinois, speaks with Sen. Stuart Adams and Rep. LaVar Christensen during discussion on SB297 - Protections for Religious Expression and Beliefs about Marriage, Family, or Sexuality, during a meeting of the House Judiciary Standing Committee, Wednesday March 11, 2015. 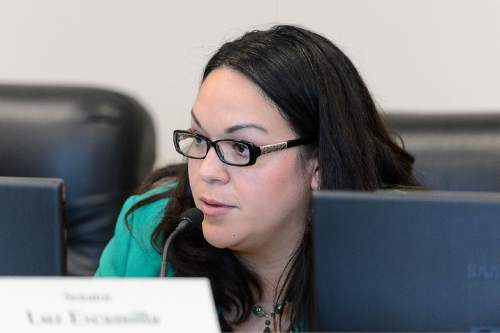 Trent Nelson | The Salt Lake Tribune Sen. Luz Escamilla, Salt Lake City, during a meeting of the Executive Appropriations Committee, Wednesday March 11, 2015. 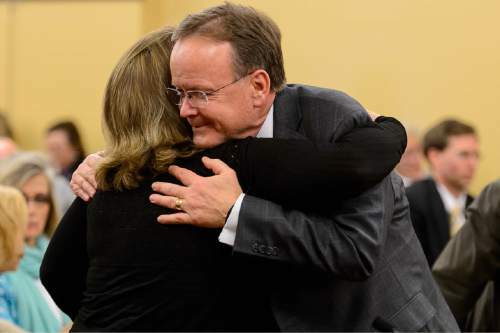 Trent Nelson | The Salt Lake Tribune Sen. Stuart Adams embraces Robin Wilson, a professor of law from the University of Illinois, after his bill SB297 - Protections for Religious Expression and Beliefs about Marriage, Family, or Sexuality, passed out of the House Judiciary Standing Committee, Wednesday March 11, 2015. 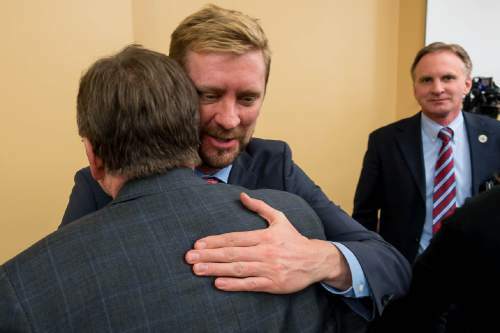 Trent Nelson | The Salt Lake Tribune Sen. Stuart Adams embraces Troy Williams of Equality Utah after his bill SB297 - Protections for Religious Expression and Beliefs about Marriage, Family, or Sexuality, passed out of the House Judiciary Standing Committee, Wednesday March 11, 2015. 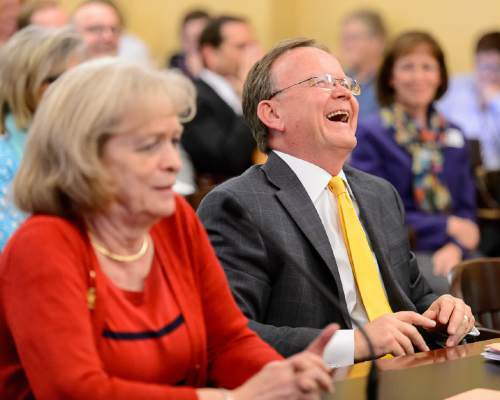 Trent Nelson | The Salt Lake Tribune Sen. Stuart Adams laughs as Gayle Ruzicka speaks about Adams's bill SB297 - Protections for Religious Expression and Beliefs about Marriage, Family, or Sexuality, which passed out of the House Judiciary Standing Committee, Wednesday March 11, 2015. 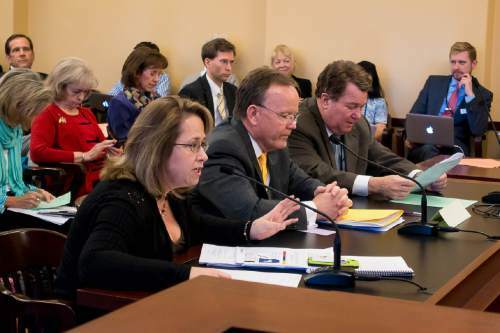 Ruzicka had made light of her and Equality Utah having a similar position on the bill. Trent Nelson | The Salt Lake Tribune Sen. Stuart Adams looks on as Troy Williams of Equality Utah speaks about Adams's bill SB297 - Protections for Religious Expression and Beliefs about Marriage, Family, or Sexuality, which passed out of the House Judiciary Standing Committee, Wednesday March 11, 2015. Trent Nelson | The Salt Lake Tribune Troy Williams of Equality Utah during discussion on SB297 - Protections for Religious Expression and Beliefs about Marriage, Family, or Sexuality, during a meeting of the House Judiciary Standing Committee, Wednesday March 11, 2015. Trent Nelson | The Salt Lake Tribune Rep. LaVar Christensen speaks during discussion on SB297 - Protections for Religious Expression and Beliefs about Marriage, Family, or Sexuality, during a meeting of the House Judiciary Standing Committee, Wednesday March 11, 2015. Trent Nelson | The Salt Lake Tribune Rep. Brad Dee, Ogden, sums up SB296 - Anti-discrimination and Religious Freedom Amendments, just prior to it passing in the House Chamber at the State Capitol Building in Salt Lake City, Wednesday March 11, 2015. Trent Nelson | The Salt Lake Tribune Gayle Ruzicka takes a phone call before discussion on SB297 - Protections for Religious Expression and Beliefs about Marriage, Family, or Sexuality, during a meeting of the House Judiciary Standing Committee, Wednesday March 11, 2015. 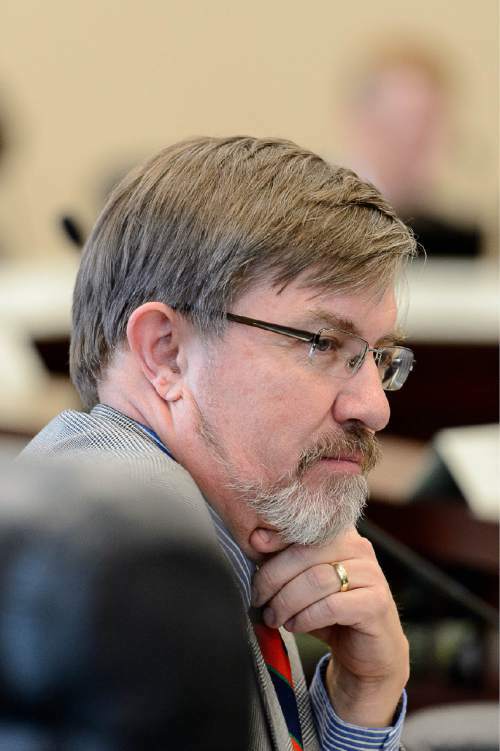 Trent Nelson | The Salt Lake Tribune Sen. Stuart Adams speaks on his bill SB297 - Protections for Religious Expression and Beliefs about Marriage, Family, or Sexuality, which passed out of the House Judiciary Standing Committee, Wednesday March 11, 2015. 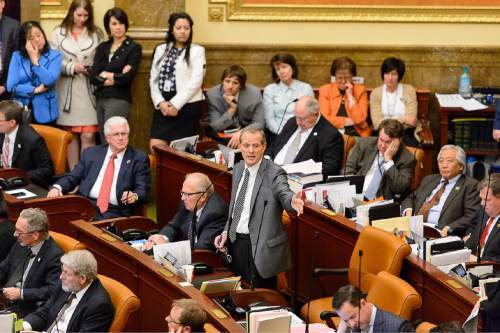 After seven years of debate and a historic compromise, the House on Wednesday voted final passage of a bill to enact Utah&apos;s first statewide nondiscrimination protections for the gay and transgender community, while providing safeguards for religious liberty. The 65-10 vote was the last legislative hurdle for SB296, just one week after it debuted with the blessing of the LDS Church and the LGBT community. Utah&apos;s Republican Gov. 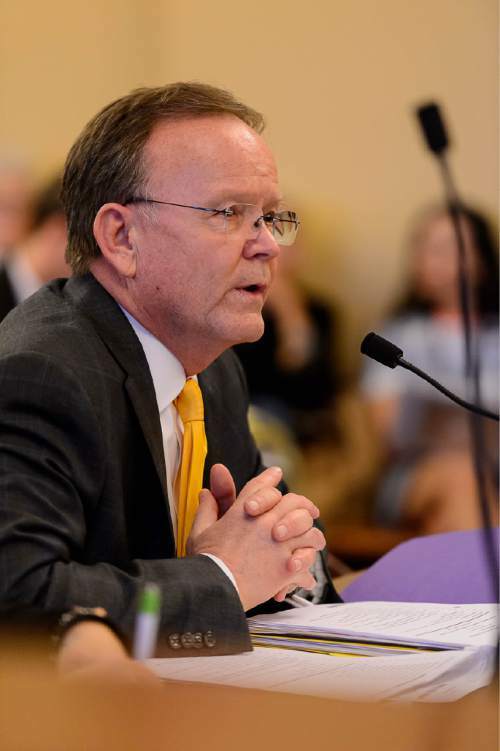 Gary Herbert is expected to sign the bill at a ceremony scheduled for 6 p.m. Thursday. Supporters in the gallery cheered and applauded as the vote count went up on the House board. Speaker Greg Hughes made a brief attempt to warn visitors that such demonstrations are against rules. But he gave up trying to stop the jubilant outburst without putting up much of a fight. The emotion in the chamber appeared to be infectious. Immediately after the vote, a reading clerk called on to read the title of the next bill was so overcome she couldn&apos;t complete the task, and another staff member took over. 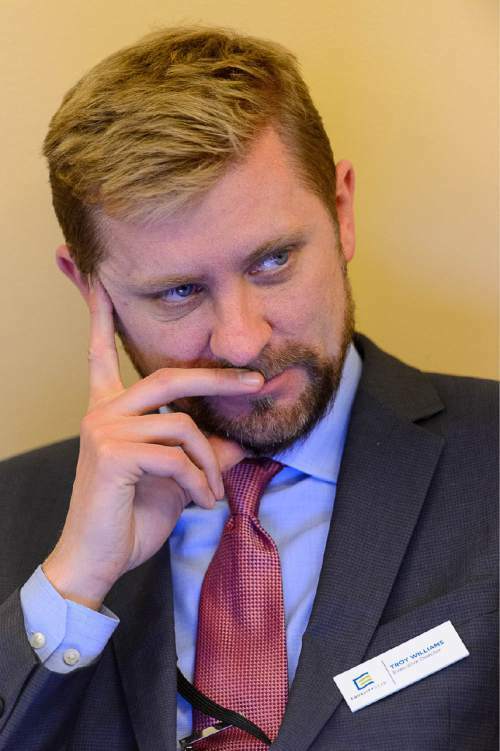 Equality Utah Executive Director Troy Williams hailed the vote as a "monumental day for Utah. This vote proves that protections for gay and transgender people in housing and the workplace can gracefully coexist with the rights of people of faith. One does not exist at the expense of the other." Under SB296, existing anti-discrimination laws for housing and employment would be amended to include sexual orientation and gender identity and clarify exemptions for religious institutions and provide protections for religious expression. The legislation would make it illegal for employers and landlords to discriminate against individuals based on their sexual orientation or gender identity. Religious organizations and their affiliates would be exempt from the bill&apos;s requirements. Rep. Brad Dee, R-Ogden, House sponsor of the measure, introduced it on the floor with a voice frequently breaking with emotion. Describing himself as "a religious person," he talked about the "long journey" he had taken to come to fully support the bill, which he called "the Utah solution." He said the issues addressed ­ namely discrimination protections for lesbian, gay, bisexual and transgender individuals ­ are ones "we sometimes feel it&apos;s best to postpone or hide from. But that&apos;s not who we are." But Rep. Ken Ivory, R-West Jordan, said the bill had come together too quickly and without adequate vetting and public debate. 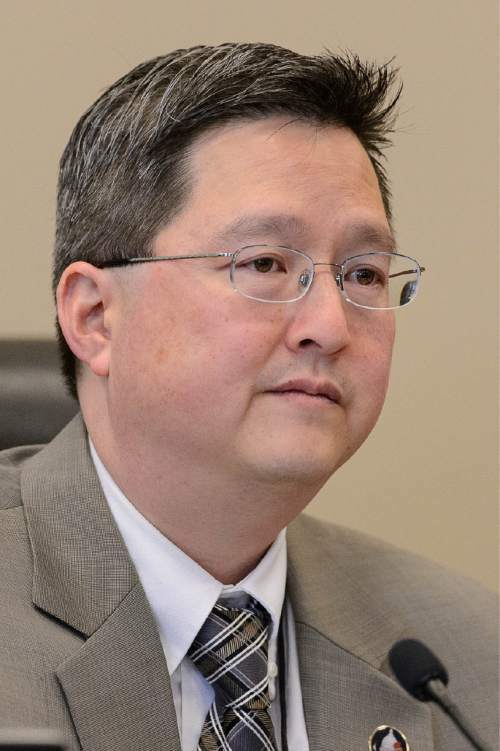 "This is a deep constitutional dive in a very shallow pool of time and process," Ivory said in opposing SB296. Such concerns over process and legalities frustrated the House&apos;s only African-American member, who said the bill was long overdue. "I stand before you today disturbed that in 2015, we have individuals in our community who are standing before us asking to be treated equal. This is embarrassing," said Rep. Sandra Hollins, D-Salt Lake City. Rep. Brad Wilson, R-Kaysville, supported the bill by trying to assuage the fears of those worried about changing Utah&apos;s fundamental character, which is dominated by the LDS Church. 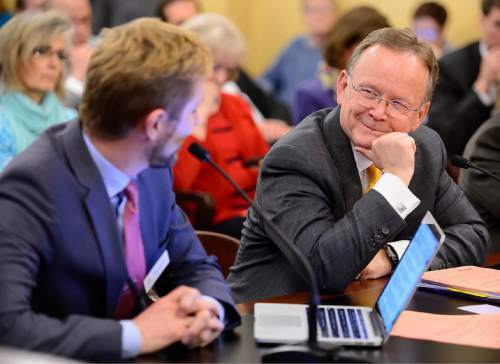 The faith claims membership of more than 60 percent of Utahns and more than 80 percent of state lawmakers. "This legislation does not  contrary to what some people claim  wash away the character of the religious community that we live in. In fact, it strengthens that character in many ways," Wilson said. "This is a place where we want all people to feel welcome and loved." With its enactment, Utah would become the 19th state to provide protections for the LGBT community in housing and employment based on both sexual orientation and gender identity, according to data tracked by the national Human Rights Campaign. No federal laws provide such protections. Nearly 20 Utah cities and counties have passed such anti-discrimination ordinances, but SB296 will supercede those and implement a uniform statute. 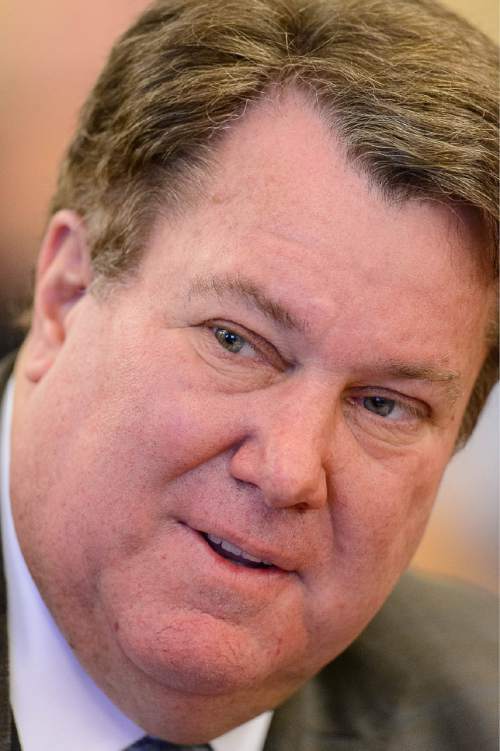 Sen. Jim Dabakis, the only openly gay member of the Legislature, said Utah now can be considered "the beacon on the hill of states … We&apos;ve found a way where people who have totally conflicting ideas, that were at the edge of war in 2008, have rolled up their sleeves, worked together and built bridges rather than blow them up. I&apos;m so proud of our state." Sen. Steve Urquhart, R-St. George, who sponsored the non-discrimination bill the last two sessions, said that the bill "changes the nature of the state." "This, to me, is hugely important, one of the most important bills I&apos;ve run in my 15 years up here. I think it will be one of the most significant for the state," he said. The support from the LDS Church, he said, was crucial. "Could I have passed this bill if the church had remained silent? No way," he said. "I&apos;ve felt like I knew where the church was since 2009, which is supportive of nondiscrimination protections, but the church had been silent since then and others had rushed in to interpret that silence, arguing the church was against them, and that was gaining traction." University of Illinois law professor Robin Wilson, a religious-liberties expert who came to Utah to help draft the bill, has said SB296 may become a model for other states because it provides both robust protections for the LGBT community, religious institutions and people of faith. The bill grew out of weeks of negotiations between lawmakers; the lesbian, gay, bisexual and transgender community; and The Church of Jesus Christ of Latter-day Saints, which has stated its rare  some have said historic  support for the legislation. The bill also specifically exempts the Boy Scouts of America, which can&apos;t be forced to hire gay leaders under a 2000 U.S. Supreme Court ruling. SB296&apos;s other religious protections would prevent workers from being fired for expressing beliefs on marriage, family or sexuality unless they conflict with the employer&apos;s business interests.